There was a time when marrying outside of your hometown meant eloping to an out-of-the-way destination where just the two of you shared your vows together. Today, the world of destination weddings is a very different one. Almost a stress-free experience for the bride, groom, and associated friends and family, these nuptials are like a vacation with one big purpose. With so many couples looking toward destination weddings, though, there have been a few places that have emerged as hot spots for that big day. 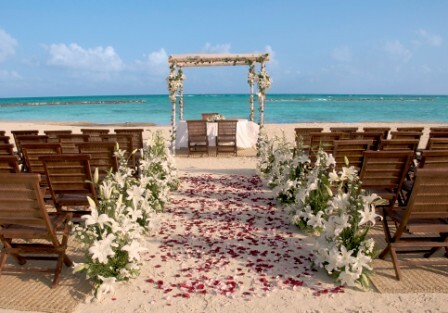 Mexico, as a whole, is one of the most popular destinations for weddings for a number of reasons. First, the weddings are perfectly legally in the United States if they’re performed by a judge. Moreover, though, is that it’s very easy to get a license to get married there, too. Cabo San Lucas is perfect in that most places accept American money and almost everyone you meet speaks English. The weather is ideal throughout the year, there are some amazing resorts, and the number of potential activities, both for the two of you and your guests, is phenomenal. You usually need to plan for about four days to complete the involved paperwork, depending on exactly where you are, and you will have to bring your passport along as well as your birth certificate. Four witnesses are also required. While it’s a fairly long flight from almost anywhere in the U.S., many couples list this as their number one destination for a wedding because it easily ranks as one of the most gorgeous tropical locales on the planet. What’s more, though, is that it’s actually in the U.S., so there are never any passport hassles required when you get ready to get married. Almost every hotel caters to destination weddings, and some even go as far as having resort chapels on the actual property. There are six different islands to choose from, so whether you want to go with a volcano in the background or a quiet, out-of-the-way beach, there’s a perfect setting to choose for you. While this offers many of the same benefits the other two tropical locations do, it has some additional pros on its own. No matter where you’re at, your wedding photos are certain to look like you’re on a movie set. There are hundreds of resorts that offer amazing destination wedding packages at a fantastic price. It’s no beach, but it is one of the single most romantic cities in the world, and there are some real benefits to getting married here. There are some fantastic clubs and museums, not to mention the fact that you’re within driving distance of the area that coined the term “wine country.” There are very few of your guests who probably don’t want to visit this historic city. After all, everything in the city seems to have been created for lovers. It’s important to note that Catholic ceremonies aren’t legally recognized in the country, so you have to have a civil ceremony first. In fact, there are some other interesting legalities regarding marriage in this country, but the right wedding planner can help you navigate all of them and have the wedding of your dreams. Image by Grand Velas Riviera Maya on Flickr’s Creative Commons. Pinkchic18 has a passion for wedding and event planning. She is also a regular contributor to the Wedding Favors Unlimited Advice Blog, where you can find loads of wedding favor ideas including unique and fun destination wedding favors!